THE STORY OF ROME AND THE GAULS (continued). Meanwhile the city was full of weeping and wailing, for none thought that they who had fled to Veii were yet alive, or that any had been saved from the battle, save such as were already come back to Rome. But when tidings were brought that the Gauls were close at hand, sorrow gave place to fear. And now the Gauls were seen to move backwards and forwards before the walls, and there was heard the sound of shouting and of the barbarous music that this people use. And still the inhabitants expected till an attack should be made upon the city. At first they thought that this would be done at the first coming of the enemy; but afterwards believed that it would be delayed until nightfall, that the terror might be increased by the darkness. Nevertheless all men bore themselves bravely, and altogether unlike to them who had turned their backs in such shameful fashion at the river Allia. For since there was no hope that the city should be defended by the small number that yet remained, it was resolved that all the young men that could bear arms, together with such of the Senators as had strength sufficient for war, should go up with their wives and children to the Citadel and the Capitol, where stores of arms and corn having been collected, they might defend the gods of Rome and the honour of the State. Also it was determined that the priests of Quirinus, and the virgins of Vesta with him, should carry away far from peril of fire and sword all that appertained to the gods, that their worship might not be interrupted so long as any should be left to perform it. For they said, "If the citadel and the Capitol, wherein are the dwellings of the Gods, and the Senate, which is the council of the State, and the youth that are of an age to carry arms, survive the destruction that hangs over the city, it is but a small matter that the aged should perish." And that the common people might bear their fate with the more willingness, the old men of the nobles that had been honoured in former days with triumphs and consulships affirmed that they would meet death together with the rest; neither would they burden the scanty stores of the fighting men with bodies that had no longer the strength to carry arms. When the old men had thus comforted one another they addressed themselves to encourage the young. These they accompanied to the Capitol, commending to their valour and strength all that now was left of the greatness of Rome. And now when they who were resolved that they would not survive the capture and destruction of the city had departed, the women ran to and fro asking of their husbands and of their sons what they should do. But of these many were suffered to follow their husbands and kinsfolk into the Capitol, none forbidding, though none called them, for that which would have profited the besieged, by diminishing the number of the useless, seemed to be barbarous and cruel. As for the rest of the people, for whom there was neither room in so small a hill nor food in so scanty a provision of corn, these went forth from the city, as it were in a great host, towards the hill Janiculum. Thence some scattered themselves over the country, and some made their way to the neighbouring cities; but there was no leader or common purpose, and each concerned himself with his own affairs only, for of the State all despaired. Meanwhile the priests of Quirinus and the virgins of Vesta, taking no thought for their own affairs, took counsel together which of the sacred things they should carry away with them and which they should leave behind, for they had not strength sufficient for the carrying of all; also in what place they might most safely leave them. It seemed good to them to put such things as it was needful to leave behind in a cask and to bury them in the ground within the chapel that was hard by the dwelling-house of the priests of Quirinus. The rest they, carried, dividing the burden of them among themselves, and went by the way that leads to the mount Janiculum, over the wooden bridge. And while they were mounting the hill, one Lucius Albinius, a man of the Commons, saw them, who was carrying his wife and children in a cart amongst the crowd that was leaving the city as having no strength for arms. This Albinius forgot not even in such peril the reverence due to religion, and thinking it shame that the priests with the holy things should go afoot while he and his were carried, bade his wife and children come down from the cart, and putting therein the virgins, with the sacred things, carried them to Caere, whither it had been their purpose to go. Meanwhile at Rome all things had been set in order, as far as might be, for the defending of the Citadel; and the old men, going back to their homes, sat awaiting the coming of the Gauls with minds wholly fixed on death. And such among them as had borne the more honourable magistracies, because they would die having on them the emblems of their old glory, put on them the splendid robes which they wear who draw the ropes of the chariots of the gods, or ride in triumph, and so sat down in their ivory chairs before their houses. Some say that, following a form of words which Marcus Folius the chief priest repeated, they devoted themselves to death for their country and for the citizens of Rome. The next day the Gauls entered the city by the Colline Gate without any anger or fury, for such as had been stirred by the battle had abated during the night; and indeed they had met with no peril in the field, nor did they now take the city by storm. So they came to the marketplace and thence looked about them on the Citadel, which alone in the city still preserved some semblance of war, and on the temples of the Gods. Here they left a guard of no great strength, lest haply some attack should be made upon them from the Capitol, while they were scattered; and the rest scattered themselves to gather spoil, some seeking it in the dwellings that were nigh at hand, and some in such as were more distant, thinking that they would find these rather untouched and abounding with riches. Thence again, terrified by the silence of the place, and fearing lest some stratagem of the enemy might be concealed thereby, they returned to the market-place and to the parts adjacent thereto. Here finding that the palaces of the nobles were open, and the houses of the common folk barred, they were slower to enter the open than the shut, for they beheld with no small reverence the men that sat each in the porch of his house, noting how great was the splendour of their apparel and their ornaments, and that the majesty of their countenances was rather that of gods than of men. So they stood marvelling at them as though they had been images of the gods, till a certain Marcus Papirius, one of the priests, smote a Gaul on the head with his ivory staff, the man having stroked his beard, which it was then the custom to wear of a great length. The barbarian in a rage slew him, and all the others also were slain where they sat. The nobles having thus perished, all others that were found in the city were slaughtered in like manner, the houses were plundered, and being emptied of their goods were set on fire. The Gauls having spent their fury on the dwellings in the city, seeing that the spirit of the Romans was in no wise subdued, but was steadfastly set against surrender, resolved to make an assault on the Citadel. Therefore, at dawn of day, after signal had been given, they drew up their whole army in the marketplace; and then, setting up a shout and locking shields over their heads in the fashion that is called the "tortoise," they began to climb the hill. On the other hand the Romans did nothing rashly or in a hurry; but strengthening the guards at every point of attack, set their main body where the Gauls were coming; and these they suffered to climb the slope, judging that the higher they should have mounted the more easily would they be driven down. But when they were come to the middle of the hill, then the Romans ran down upon them, and made a great slaughter among them, driving them over the steep, so that never again, either with a part of their force or with the whole thereof, did they make trial of this manner of fighting. They set themselves, therefore, to take the Citadel by blockade. But for this they had made no preparation, having burned all the provision of food that was in the houses of the city, while that which was in the field had by this time been carried into Veii; wherefore, dividing their forces, they set some to keep watch on the Citadel, and some they sent to gather spoil in the country round about. Now they that were sent to gather spoil came by chance to Ardea, in which city Camillus dwelt, grieving for his country rather than for himself, and marvelling what had befallen the men who with him had conquered Veii and Falerii. And now, hearing that the Gauls were near at hand, and that the men of Ardea, being in no small fear, were taking counsel about the matter, he came forward in the assembly and spake thus: "Men of Ardea, ye have now opportunity to repay the benefits which ye have received from the Roman people, concerning which benefits, how many and how great they be, there is no need that I remind you. And ye have opportunity also to win for yourselves great renown. These Gauls that are coming against you are great in stature rather than in strength, and make a terrible show in battle, but yet are not hard to withstand. For consider what has befallen Rome, They took the city when all the gates lay open; but now the Citadel, though it is kept by a small company, they are not able to take. Wearied already of besieging it, they are scattering themselves over the face of the land to gather spoil. Their manner is to gorge themselves with meat and great draughts of wine, and at nightfall to throw themselves on the ground like beasts, without defence or outposts or guards. And now by reason of their late victory they are careless even beyond their wont. If then ye would keep your city safe, and would not have this whole land become a part of Gaul, take all of you your arms at the first watch of the night. Follow me, and if I deliver them not in your hands, fast bound with sleep, to be slaughtered as cattle, then banish me even as the Romans banished me." Meanwhile the Gauls watched the Citadel at Rome, that none should go forth between the posts. And now there was done by a Roman youth a thing which both friends and foes greatly admired. The house of the Fabii had a yearly sacrifice on the Hill of Quirinus. A certain Quintus Fabius Dorso, therefore, that he might duly perform this sacrifice, came down from the Capitol, clad in the vestment that is used for such purpose, and carrying the holy things in his hands, and so came to the Hill of Quirinus, passing through the midst of the guards of the enemy, and heeding not their speech or threatening. There he duly performed all the ceremony, and, coming back by the same way, with look and step composed as before, returned to his friends in the Capitol, having a good hope that the gods, whose service he had not neglected for any extremity of fear, looked upon him with favour. As for the Gauls, they did him no harm, either for wonder at his boldness, or for religion's sake, for which indeed this people had no small regard. While these things were being done at Veii, the Citadel of Rome had been in great peril, for the Gauls either had seen the footmarks where the messenger from Veii had climbed into the Capitol, or had observed for themselves that there was an easy ascent by the rock of Carmentis. On a moonlight night, therefore, having first sent a man unarmed to make trial of the ascent, they set out. Their arms they handed one to the other, and when there was any hindrance in the way they supported or drew up each other, and so climbed to the top, and this so silently that they did not even wake the dogs, though these animals are very watchful for any noise that may take place in the night. But they escaped not the notice of the geese, for there were geese in the Capitol, and these, being sacred to Juno, they had not eaten, though being sorely in need of food. And this regard for holy things was their salvation. For a certain Marcus Manlius, being awoke by their cries and by the flapping of their wings, hasted forth, catching up his arms, and calling all the rest to do likewise. And they indeed were at first in great confusion, but Manlius drave the boss of his shield against a Gaul, for one was now standing on the very top of the hill. And the man fell and overthrew them that stood close at hand; and when the others in great fear dropped their arms and laid hold of the rocks, he fell upon them and slew them. By this time others also had rallied to him, and these, throwing javelins and stones upon the Gauls, beat them down, so that the whole company were overthrown and fell headlong down the steep. The rest of that night they slept, so far as they could for remembrance of the great peril from which they had been delivered; and at dawn all the soldiers were summoned to an assembly by sound of the bugle, it being needful to give due recompense both to that which had been well and that which had been ill done. First Manlius received both praises and gifts for his valour, and this not only from the captains, but from the common consent of the soldiers, every man carrying to his house, which was in the Capitol, half a pound of corn and half a pint of wine, a gift which seems indeed very small in the telling, but yet was a great proof of affection, the great scarcity of all things which prevailed at the time being considered, since all subtracted something from their necessary food to give it to this one man. After this the guards that had been set to watch the place by which the enemy had climbed up the hill were summoned to the assembly. 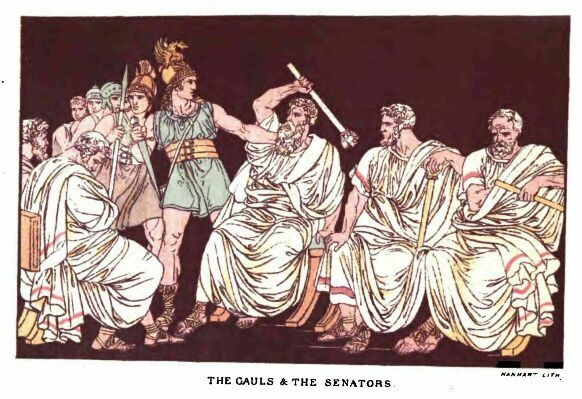 Of these, though Sulpicius, tribune of the soldiers, had affirmed that he would deal with all of them according to military custom, only one was punished, all agreeing to throw the chief blame on him, and he, being beyond all doubt guilty in the matter, was by common consent cast down from the rock. After this the watch was kept more diligently on both sides, for the Gauls knew that messengers had gone to and fro between Veii and Rome, and the Romans remembered from how great a peril they had escaped. Beyond all other evils of war famine troubled both armies. The Gauls were vexed with pestilence also, having their camp in low ground that lay among hills, and was scorched with the burning of the houses. If there was anything of wind also, this brought with it not dust only but ashes. All these things and the heat of the year the Gauls, who are accustomed to wet and cold, were little able to endure, so that they died, as it were, in herds; so that their fellows, wearied of burying the dead one by one, made great heaps of their carcases and burned them with fire. And now a truce was made with the Romans, and conferences held. In this the Gauls spake much of the famine as being good cause of surrender; whereupon, it is said, the Romans threw loaves of bread among their posts, as if to show them that there was no scarcity among them. Nevertheless their hunger was such that now it could neither be hidden nor endured. Wherefore, while Camillus levied an army at Ardea, the garrison of the Capitol, worn out with watching, and yet able to endure all other ills save hunger only, seeing that the help they looked for came not, and that when the guards went forth to their watch they could scarce for weakness stand up under their arms, were resolute that they should either surrender or ransom themselves on such terms as might be had. And this they did the more readily because the Gauls had made it plain that they might be persuaded by no great sum of money to give up the siege. The Senate, therefore, was called together, and the matter was entrusted to the tribunes of the soldiers. After this a conference was held between Sulpicius and Brennus, king of the Gauls, by whom it was agreed that a thousand pounds' weight of gold should be the ransom of a people that was thereafter to rule the world; a shameful thing, made yet more shameful by insult. For the Gauls bringing false weights which the tribune refused, King Brennus threw his sword into the scale that held the weights, saying at the same time words that no Roman could endure: "Woe to the vanquished!" But both gods and men forbad that Rome should be ransomed in this fashion. For before the payment was made, the whole quantity of gold not having been weighed by reason of this dispute, the Dictator coming up commanded that the gold should be taken away, and bade the Gauls depart. These indeed made opposition, affirming that the covenant had been made and must be performed; to which Camillus made answer that it had been made without his permission by a lower magistrate he being at the time Dictator, and he warned the Gauls to make them ready forthwith to battle. To his own men he gave command that they should throw their baggage into a heap and gird on their arms. "Ransom your country," said he, "with steel rather than with gold, having before your eyes the temples of the Gods, your wives, your children, and all which ye most desire." After this he drew up in line of battle, as well as the place permitted, being covered with the ruins of the city. The Gauls, troubled by these things, which had happened beyond all their expectations, took up their arms and ran upon the Romans with much rage but little skill. And now (such change was there in fortune) they were put to flight no less easily than they had put the Romans to flight at Allia. There was yet another battle between the Gauls and the Romans; and this was fought at the eighth milestone on the road to Gabii, for to this place they had fled from Rome. Here there was slaughter without end. The camp of the Gauls was taken, and all perished, so that not so much as one was left to carry home the tidings. Then Camillus returned in triumph to Rome, being greeted by the soldiers in their rude fashion as a second Romulus, the true father and founder of his country. First, being always careful of things that concerned the gods, he proposed that all the temples should be duly restored and purified; that the people of Caere should be admitted to the friendship of the Roman people, because they had given shelter to the priests and the virgins and the sacred things, and that games should be held in honour of Jupiter of the Capitol as having delivered the city from the enemy. The gold that had been taken from the Gauls, with that which had been taken from the temples, no one knowing to whom or to what place it appertained, was to be laid beneath the throne of Jupiter. To the matrons public thanks were given, with this honour, that they should be praised with funeral orations in like manner with men. Then he spake about the counsel of departing to Veii, showing them many causes why they should refuse it, and this above all others, that it was not lawful to worship the gods of their country in any other place but only in Rome. But that which prevailed with them more than all the speech of Camillus was a word spoken by chance. While the Senate debated the matter in the Hall of Hostilius, certain cohorts that were returning from keeping the guards passed through the market-place, whereupon a centurion cried out, "Standard-bearer, set up thy standard. We shall best remain in this place." And when the Senate heard these words they exclaimed with one voice, "We accept the omen;" and the multitude of the people that stood around approved.